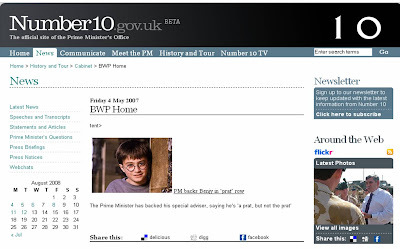 The 10 Downing Street website has been re-launched to incorporate a range of social media elements. It now aggregates the 10 Downing St Twitter, the 10 Downing Flickr profile, e-petitions and the Ask Gordon Brown / 10 Downing Street YouTube account. David Cushman and Dan Calladine have gone into more depth on the Downing Street site relaunch. Whilst the new interactive elements of the 10 Downing Street site aim to revitalise the site, some of the new content has created controversy. I think it's great that number 10 is opening up a bit more and sharing information from behind the scenes through Twitter, Flickr and YouTube. However, whilst the 10 Downing Street site should be a powerful vehicle for Gordon Brown to engage the electorate, it won't work if the staff behind it continue to indulge in internet jolly japes - the number 10 website needs to focus on delivering unique insight and behind the scenes information from inside the workings of government.